This is Joe. He’s an American hero. Why so difficult Jeff?!? you’re thinking. I stand-up tunnels and tear them down all day long, I route/switch in my sleep and verily I say unto you that my packets always find their way home, tags intact, whether on the WAN, between switch closets in the campus, or between nodes in the datacenter! Verily they do indeed, and I salute you, you herder of stray packets! It’s not that the technology connecting core to branch is hard or difficult, no, what I’m bitching about today is connecting the branch site to the internet in the first place. Truly, ordering internet service for a small or even medium-sized branch office is one of the most painful exercises in modern IT. You Bing/Google various iterations of “Lake Winnepesaukah ISPs,” , “Punxatawney Packet Delivery,” , “Broadband Service in Topeka,” “Ethernet over Copper + Albuquerque,” “Business Cable Internet – Pompano Beach, FL” and such. Dismissing the spam URL results on Page 1-12, you eventually arrive at Comcast, Time Warner, or Charter nee Spectrum Business, or whatever little coax fiefdom has carved out a franchise at the edge of your business. You visit their website, click “Business” and fight your way through pop-ups and interstitials to a page that says it can verify service at your branch office’s address. Right, you think, I’ll just Tab-tab my way through this form, input my branch office address here, punch that green submit button there, and get these nasty Layer 1 bits out of the way. But this isn’t the old days of 2009 when you could order a circuit online or at least verify service…oh no, no sir, this is the future…this is 2015. In 2015, you see, the Cable providers demand audience with you, so that they can add value. Pay the Last Mile Toll: So you surrender your digits and wait for a phone call. When it rings 36-72 hours later, you’re determined to keep it short. What you want is a simple yes/no on service at your ROBO, or an install date, but what you get is a salesperson who can’t spell TCP/IP and wants to sell you substandard VoIP & TV. “Will you be uploading or downloading with this internet connection?” is just one of the questions you’ll suffer through to mollify the last mile gatekeepers standing between you and #PacketGlory on the WAN. At long last, install day arrives: You’ve drop-shipped the edge router/overlay device, you’ve coordinated with the L-con, and the CableCo tech is on site at your ROBO to install your circuit. Hallalelujah, you think, as you wait for the tunnel to come up. But it never does, because between your awesome zero-touch edge device & your datacenter lies some crazy bespoke 2Wire gateway device that NATs or offers up a free wifi connection to the public on your dime. Another phone call, another fight to get those things turned off. Nuts to all that, I say. Friction free: In place of the coax fiefdoms and gatekeepers, the 1-800 numbers, and the aggressive salespeople, there’s just Joe, a real engineer at a local fixed wireless ISP. Joe’s great because Joe’s local, and Joe takes your order, gives you his mobile, installs the antenna at your branch, and hands you a blue wire with three static IPs. Super-fast to deploy. You want internet at your ROBO? Well guess what? It’s already there, you just need the equipment to catch it. As Secure as Anything Else These Days: How difficult would it be to perform a man in the middle attack via interception of a fixed wireless connection? I’m not sure, to be honest, but if you aren’t encrypting your data before it leaves your datacenter, you have a whole lot more to worry about than a blackhat with a laptop, a stick, and a microwave antenna. 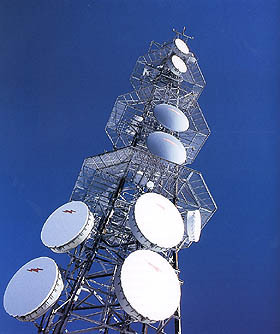 Cost competitive: I’ve deployed a couple of fixed wireless connections and I find the cost to be very competitive with traditional cable company offerings. Typically you’ll pay about $200 for the antenna install, but unlike the fee Comcast would charge you to install their modem, I think this is justified as it involves real labor and a certain amount of risk. Regional/Hyper-local but still innovative: For whatever reason, fixed wireless ISPs have proven resistant to the same market forces that killed off your local dial-up/DSL ISP. Yet this isn’t a stagnant industry; quite the opposite in fact, with players like Ubiquiti Networks releasing new products. I’ve been working on the WAN a lot lately and I’ve deployed two fixed wireless circuits at ROBOs. If you’ve got similar ROBO WAN pains, you should have a look at fixed wireless, you might be surprised!